UPDATE on Jan 15th: Linden Lab announced that the problem has been solved, as Inara Pey mentioned in a comment below. In my journey through Second Life’s grid, I found last Friday, January 11th, a protest organized by Tinies at Governor Linden’s Mansion. They were demanding that Linden Lab fix a bug that has been affecting hover height in general, but which has been particularly bad for short, small avatars. The place chosen for the demonstration was significant: built in 2002, the mansion is an example of architecture in early Second Life, completely based on SL native prims; and in the basement, it shows pictures of old times, the world map back then and images of those days when the grid was known as Linden World. The sim was packed when I arrived, and adjacent sims were getting crowded, which means that the protest attracted a significant number of avatars. Though SL is not – and it’s not meant to be – a democracy, demonstrations are a tradition in its domains. In this sense, this long living virtual world by Linden Lab is a particular walled garden: one where you can join forces with other members and mobilize the community to actually gather, even if only virtually, showing signs and marching for your causes. That’s why a protest in SL is, for me, a stronger experience, in personal terms, than, for example, those of enlarging the outreach of a protest post in a social network. Even knowing that probably the influence of a demonstration in SL will be smaller, I feel more involved in the manifestation. 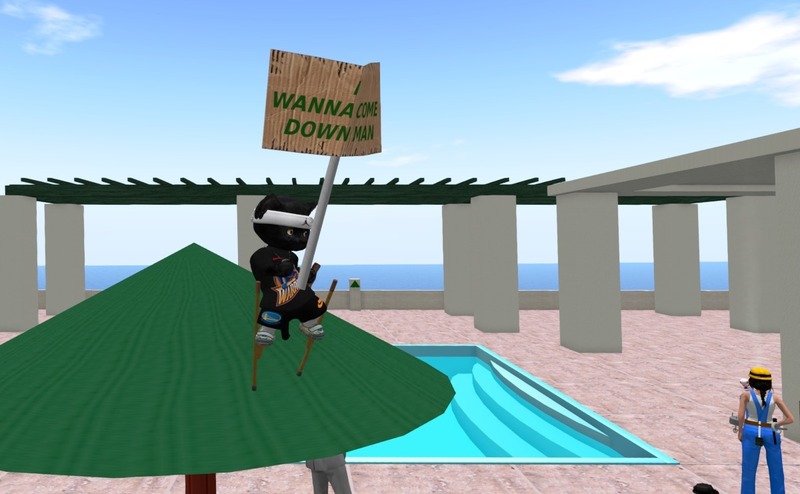 In the tradition of demonstrations in Second Life, we have seen a wide range of causes. There have been avatars marching for labor conditions in enterprises that used to have some presence in SL; against the increase of Openspace (remember it?) tier fees; against violence in Gaza; for tax reduction in the US along with other Tea Party demands… And they have gathered in Ahern, Natoma and a number of other significant places on the grid. Among the most overwhelming demonstrations I remember was one of solidarity, when residents gathered in the virtual Paris 1900 and its Eiffel Tower following the terrorist attacks of November 13th, 2015, in the real life Paris. In that occasion I saw people from all around the world standing for the victims of that abomination and showing strong disapproval of violence and terror. The protest by Tinies and other avatars on Friday was not a small one, and, also because of that, it was a reminder to me that community is there, in SL. Not only the sense of community, but the actual community acts and performances: people still care enough to join forces and fight for what they believe – and it wasn’t only hover height that was at stake, but the demand that Linden Lab address the concerns of their public. I have decided to sympathy-float with the tinies for one month in support of their struggle! Hey, I see you there: https://bocksl.blogspot.com/2019/01/float-with-tiny-community.html – and thank you for sending me the stilts in SL. While the frustration is understood, the Lab has actually been trying to resolve the issue for the last few weeks, even pulling resource from the Bakes on Mesh (BoM) project in order to locate the underpinning problem. The root cause has now been found to be within the avatar Bake Service. As of last week, a fix had been passed to the Lab’s QA team for internal testing, so will hopefully be appearing in a viewer update very soon (I have no idea if it will first appear in the BoM project viewer (due for an update this week), or in the next Maintenance RC (which I assume would be the case). Details on the problem and the fix can be found in my weekly Content Creation UG summaries at: https://modemworld.me/tag/content-creation/ . I also passed this info on to one of the organisers of the protest. Thank you, Inara, it’s good news. I know there are some complains out there about how Linden Lab now only cares about Sansar – but, to be honest, that’s not my experience: I do feel they are paying attention to SLers, and the fact that they are making efforts to fix this bug seems to be a confirmation of my perception. This was really uplifting, thank you. If you’re doing your own thing in Seconf Life it can feel alienating when you don’t run into other avatars for awhile. It’s nice to be reminded of all the friends I’ve made in Second Life, too. I’ve always thought of SL as a way to share experiences, but, yes, sometimes we can see ourselves so involved in our own stuff that it may be easy to forget that. Been there, done that. But at some point, I could recall that I’ve met some great people in Second Life, and that I’ve seen the community act as a community more than once – and then I realized that, for me, this is a remarkable characteristics of SL. Turns out the issue was purely back-end, and the Bake Service update was cleared by QA and deployed on January 14th. See: https://secondlife-status.statuspage.io/incidents/95ylzcn80mp1 . No need for a viewer-side update in support of it.. Thank you for the news, I updated the post.